The South African city offers visitors a wide range of outdoor activities amidst a myriad of breathtaking vistas. Cape Town is the second largest city in South Africa, and to sum it up in the words of the locals, it is simply stunning. The tight-knit Jewish community in South Africa dates back to the 15th century with the early explorers and directors from the Dutch East India Company. However, the first congregation in South Africa was founded in Cape Town in November 1841. The scenic backdrop of Cape Town is Table Mountain; it has a perfect view of all the areas of the city. If you face north from the top of the mountain, you will find the city center, where the docks are filled with ships. On the west side there is a magnificent mountain range known as the Twelve Apostles. It borders a beautiful beach called Camps Bay, which is filled with bustling bars and restaurants. On the south side, the mountains are filled with historic vineyards and the gorgeous, must-see Kirstenbosch Botanical Gardens. Beyond the gardens and the Constantia suburbs is False Bay, which curves toward Cape Point. As you tour the mountain, over on the east side you can see Cape Town’s international airport. Cape Town is a city filled with outdoor activities. There are adventures waiting to be had, such as windsurfing around Table Bay or jumping off Lion’s Head and paragliding close to Clifton. There are a myriad paths for mountain biking and hiking all over the city, whether it be Kirstenbosch, one of the most magnificent botanical gardens in the world, or anywhere on the huge stretches of beach. The Jewish community is extremely welcoming, and the people I met had a wonderful sense of humor. Late one Friday afternoon, I knocked on the door of a store in Camps Bay because I wanted to buy the beach towel hanging in the window. The shop owner, who was just closing, smiled, unlocked the door and let me in. While I was paying, he noticed my name, told me he had been to Masada, and with a wicked grin asked me, “Shouldn’t you be going to synagogue?” I smiled and agreed with him. As we got talking, I found out he was close friends with my father’s first cousin, who had died more than 10 years ago. Talk about Jewish geography. I stayed in the Sea Point area of the city, and it felt like a mini-Israel. On Shabbat, lots of families were walking back and forth from shul. There are a few kosher restaurants to try, and even more synagogues. While staying in Cape Town, besides enjoying the city, there are a few day trips to areas that are breathtaking. These can be taken with a tour, or you can drive yourself if you feel confident driving on what for many visitors is the other side of the road. The first is South Africa’s world-famous Cape Wine Lands around Stellenbosch, Paarl and Franschhoek. The enormous mountains are filled with valleys full of vines. There are dozens of wineries where you can go wine tasting, have lunch or simply enjoy the beautiful scenery. One winery called Spier is lovely but extremely touristy. It has a beautiful outdoor garden filled with couches where one can relax and have lunch. Women come around and, if you want, they will paint your face with traditional African symbols. I had a fallen star painted on me, symbolic of the word “lady.” Spier also has a gift shop filled with interesting African items, as well as a cheetah sanctuary where, for a nominal fee, you can pet the animals. There are many wineries to see. While I would recommend Spier, definitely continue because the landscape changes and becomes more beautiful as you drive along toward all three cities. Another day trip is to Cape Point and the Cape of Good Hope, where the Indian Ocean meets the Atlantic. The winding roads are filled with glorious views of green mountains with steep drops into the blue ocean. This is where sailors rounded Africa en route to India. It’s not the southernmost point, which is at Cape Agulhas, but it is certainly worth a visit because of the stunning scenery. On the way you will pass Muizenberg, a beach town that has long white sandy beaches and is where Agatha Christie went surfing 80 years ago. On this side of the peninsula, known as False Bay, the sea is warmer and some of the best whale-watching spots can be found. This drive is dotted with little markets on the sides of the roads, filled with beautiful carvings. The vendors sell a variety of African goods, such as soapstone statues from Zimbabwe, which are gorgeous, as well as jewelry and wood items. One of my favorite stops on this day trip was Boulders Beach. It is past Fish Hoek and south of Simon’s Town, historically an important naval base for the British and now the principal South African navy base. The well-preserved 18th-century streets are filled with shops and are architecturally pretty, but you can’t beat the penguin colony just south of town at Boulders Beach. 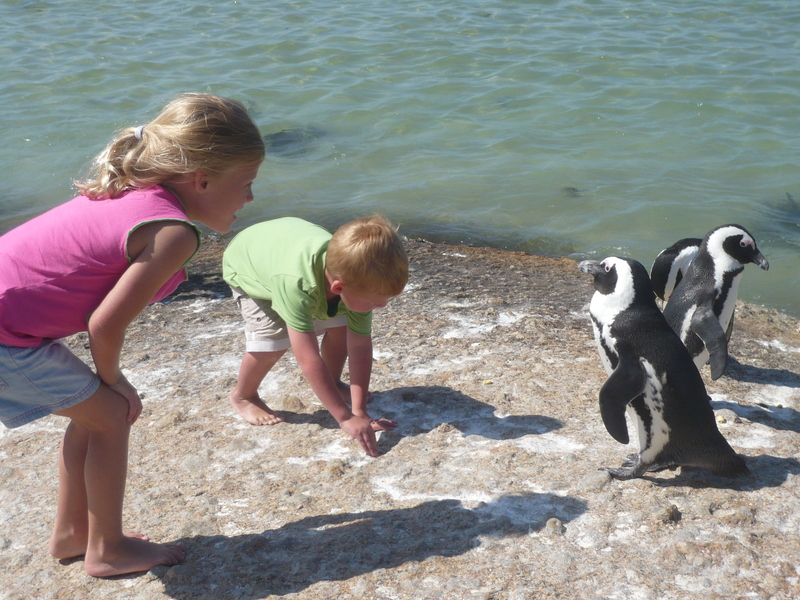 Boulders Beach has a nature reserve set aside for the penguins. For a small fee, you can get a wonderful view of them marching out of the ocean and hanging out. Nearby is a small beach, where the penguins were resting on the rocks and swimming alongside people in the water. I sat with the penguins for a bit and was so close to them I could touch them, truly a remarkable experience. (From what I hear, they are often there.) Cape Town is a must-see city. To help you plan a trip there, here are a few helpful websites: www.uos.co.za/; www.jewishweb.co.za/; www.paarlonline.com/; www.simonstown.com/; http://www.southafrica.net/.